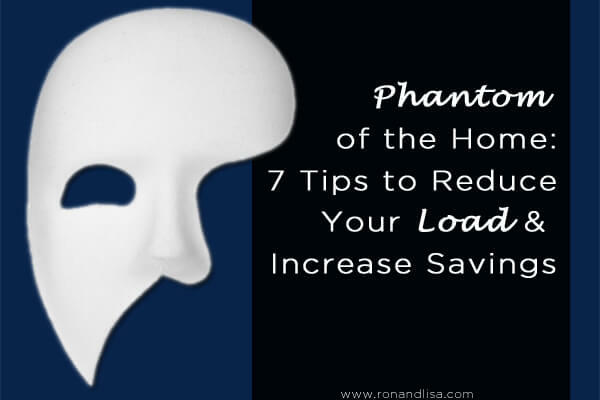 If the sight of your monthly electric bill causes you to belt out a high note shriek, it may be time to reduce your phantom load. If you are unfamiliar, a phantom load is the leaking current, or the small amount of electricity drawn by appliances even when they are turned off. Many people are unaware that by reducing this leaking electricity consumption, one can make an improved impact on rising electric bills. Years ago, the number of electronic goods and gadgets in a house was far fewer, so the impact of phantom loads on energy use and costs was negligible. Today, however, with the number of electronic appliances and gadget use increasing, this leaking current can play quite a role in creating a hole in your pockets through increased electricity bills. So, this begs the question how can one reduce their own phantom load? First, let’s clarify that eliminating a phantom load is not a difficult task. There are a few simple things to remember that can easily help you can save both energy and money. For starters, unplug devices when not in use. Many of us switch off the devices connected to a power strip, but leave the power strip on. In such instances, either remove the plug of the device from the power strip, or switch off the power strip itself when usage is not required. Whenever you plan to buy a new electronic appliance or device, ensure that you invest in ENERGY STAR products. The reason that ENERGY STAR products are so highly recommended is because they consume 20- 25% less power than their counterparts; resulting in lower electricity bills. It’s safe to say that saving energy is not only essential for reducing bills, but also helps us reduce our personal carbon footprint. Using green power is the best way to achieve both these targets easily and conveniently. As most of you would have already guessed, green power refers to the electricity generated from renewable energy sources like hydropower. Though the concept of using green power has not been widely promoted, those who are conscious about environmental preservation and who simultaneously wish to save money on bills are most likely already utilizing it. A little investment upfront can have a nice return on your investment. In fact, the state of California has special rebates for homes that are Green Point Rated. Additionally, several states in the U.S. offer consumers benefits for using green power. Log onto the U.S. Department of Energy’s website HERE to find out where you can purchase green power in your state. Use the Smart Strip brand power strip for your computer, printers, and other computer equipment. This can protect the devices during electrical surge, while reducing the phantom load. These strips have a sense to understand whether a device if off or not. If it finds a device is off, it does not supply any current to it. Laptops use less energy than desktops. That’s why most multinational companies are promoting the use of laptops versus regular desktops. Electrical appliances such as coffee makers continue to draw small amount of electricity even when off. Hence, it is best to unplug them after use. Cell phone chargers draw electricity when connected to the plug, even when switched off. Switching to green power and buying ENERGY STAR products will help reduce your phantom load. Purchase Just GREEN It! This small book is loaded with hundreds of simple swaps to save the planet, your health and your wallet! Get an energy audit. These run in the neighborhood of $400, but some utility companies will offer them for free and some states will reimburse you the cost. Do you have a second refrigerator in the garage? It may be costing you $200 a year in electricity just to store excess beverages. Your state may have rebates or recycling incentives to upgrade the ol’ Frigidaire a more energy efficient model. Reducing your phantom load is not an impossible task; it merely requires awareness and a few small, green, baby steps. Inch by inch…it’s a cinch! For more tips on saving money by living green, visit HERE. How’s that for music to your ears?